Want a fun and interactive way for your kiddos to learn about character traits? 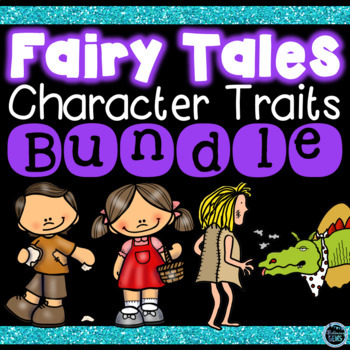 This fairy tales activities bundle provides numerous activities for your students to cement their understanding about character traits and physical traits of characters. Plenty of resources to choose from to keep your students actively engaged. Perfect addition to your fairy tales unit or character studies, which can be incorporated into your literacy centers, guided reading lessons, early finishers, character traits lessons and class discussions! By purchasing this bundle you will save over 35% off! This kit consists of a variety of cut and paste activities, NO PREP worksheets which provides students with additional practice to review character traits and physical traits of Elizabeth, Prince Ronald and the dragon. ♥ Cut and paste worksheets - students cut and paste the character traits for Elizabeth, Prince Ronald and the dragon. ♥ Cut and paste worksheets - students cut and paste the physical traits for Elizabeth at the beginning of the story, the paper bag princess, Prince Ronald and the dragon. ♥ Bubble map worksheets - students write their own character traits to describe Elizabeth, Prince Ronald and the dragon. ♥ Bubble map worksheets - students write their own physical traits to describe Elizabeth, Prince Ronald and the dragon. ♥ Answer sheets for cut and paste activities - you can use the answer sheets as anchor charts to display on your bulletin board, so students can refer to them whilst writing. ♥ Find the Evidence Worksheet - Students find evidence in the text to match the character traits of Elizabeth, Prince Ronald and the dragon. 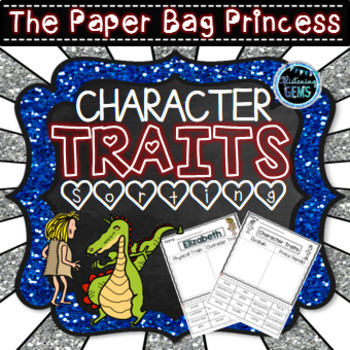 The Paper Bag Princess pack includes a variety of character trait & physical trait sorts, cut and paste activities and printables for students to consolidate their understanding of character traits. By undertaking these activities students are expanding their vocabulary and making inferences about characters in order to sort the words correctly. • Sort the character traits and physical traits for: Elizabeth, Prince Ronald and the dragon. •Written worksheets – students write their own character traits and physical traits to describe each of the characters. Students will also describe the appearance of the characters. •Sort the character traits to compare Elizabeth and Prince Ronald. •Written worksheet – students write their own character traits for Elizabeth and Prince Ronald. Students will also write about which character they are most like. •Synonym& Antonym activities – sort the character traits into synonyms and antonyms for the words: brave and mean. Character Traits Yes/No Game is a perfect resource to use as a book companion after reading the story, 'The Paper Bag Princess' by Robert Munsch. By playing this fun and interactive game, it will assist students to make inferences about characters, expand their vocabulary and consolidate their understanding of character traits. •If group of 6 students, give each student 8 character trait cards to place under the yes or no heading, and put the remaining 4 character trait cards aside. •Students take it in turn to select a character card and sort their cards under the correct heading. •Ask each student to provide evidence or a reason why they think the character displays that character trait or not. These task cards are designed for first grade to third grade to provide your students with practice with identifying character traits, feelings and physical traits of characters in the story, "The Paper Bag Princess" by Robert Munsch. These multiple choice questions will allow your students to make inferences about characters. Want a fun and interactive activity to help teach your students about character traits? The pack is a book companion for the fairy tale, 'Hansel & Gretel." It includes a variety of character traits and physical traits cut and paste activities and printables. By undertaking these activities students are expanding their vocabulary and making inferences about characters in order to sort the character traits correctly. • Cut and paste sorting worksheet – sort the character traits for Gretel and the witch. • Worksheet - students list their own character traits to describe Gretel and the witch. They then describe the Gretel’s best quality/character trait. • Cut and paste sorting worksheet – sort the character traits for Hansel and his stepmother. • Worksheet - students list their own character traits to describe Hansel and the stepmother. They then write a sentence to describe the stepmother’s worst quality. • Cut and paste sorting worksheet – sort the physical traits to describe Gretel and the witch. They then write a sentence to describe Gretel’s physical traits. • Cut and paste sorting worksheet – sort the synonyms and antonyms for the character trait smart. • Cut and paste sorting worksheet – sort the synonyms and antonyms for the character trait cruel. • Answer sheets included for all cut and paste activities. Character Traits Yes/No Game - Is a fun and interactive game, that will assist your students to make inferences about characters, expand their vocabulary and consolidate their understanding of character traits. • 5 character cards - Hansel, Gretel, Father, Stepmother and the Witch. •If group of 6 students, give each student 10 character trait cards to place under the yes or no heading, and put the remaining 4 character trait cards aside. Want a fun hands on center activity for reviewing character traits for the fairy tale, 'Hansel & Gretel?' This kit consists of a variety of cut and paste activities; NO PREP worksheets which provides students with additional practice to review character traits and physical traits of the main characters in the story. These activities are a great book companion for the story, Hansel and Gretel. 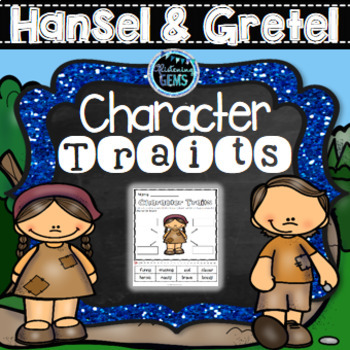 ♥ Cut and paste worksheets - students cut and paste the character traits for Hansel, Gretel, witch, stepmother and father. ♥ Cut and paste worksheets - students cut and paste the physical traits for Hansel, Gretel and the witch. ♥ Bubble map activities - students write their own character traits to describe the qualities of Hansel, Gretel, witch, stepmother and father. ♥ Bubble map activities - students write their own physical traits to describe the appearance of Hansel, Gretel and the witch. This pack consists of 34 brightly colored blue word wall cards including the characters and character traits for the popular fairy tale, 'Hansel & Gretel'.' Students can use these cards when writing character trait clues for their Who am I writing activities. These activities are in color and black lined. • 1 worksheet - students write a character trait to match each character - suited for students who can construct a simple sentence. • 5 worksheets - students write 3 character traits to match the characters: Hansel, Gretel, witch, stepmother and father - suited for students who require extension or the more able writers. • 34 word wall cards including characters and character traits. Display the cards on a bulletin board in your class where students can visibly see the cards whilst writing. Students can use the character trait cards when writing clues for their Who am I activity. * Word Study - looking at synonyms and antonyms of character traits. Want a fun and interactive activity to help teach your students about character traits? The pack is a book companion for the story, 'The Wonderful Wizard of Oz." by L. Frank Baum. It includes a variety of character traits & physical traits cut and paste activities and printables. By undertaking these activities students are expanding their vocabulary and making inferences about characters in order to sort the character traits correctly. • Cut and paste sorting worksheet – sort Dorothy's traits into character traits and physical traits. • Worksheet - students list their own character traits and physical traits for Dorothy. Make an inference about Dorothy. and write a sentence about why you infer she displays that particular character trait. • Cur and paste sorting worksheet - sort the character traits for Glinda and the Wicked Witch. • Worksheet - students list their own character traits and physical traits for the Lion. Make an inference about the Lion. and write a sentence about why you infer he displays that particular character trait. • Worksheet - students list their own character traits and physical traits for the Tin Man. Make an inference about the Tin Man. and write a sentence about why you infer he displays that particular character trait. • Worksheet - students list their own character traits and physical traits for the Scarecrow. Make an inference about the Scarecrow. and write a sentence about why you infer he displays that particular character trait. • Synonym and Antonym cut and paste activity for the character trait nasty. • Synonym and Antonym cut and paste activity for the character trait sneaky. This kit consists of a variety of cut and paste activities; NO PREP worksheets which provides students with additional practice to review character traits of the main characters in the story. These activities are a great book companion for the story, The Wonderful Wizard of Oz by L. Frank Baum. ♥ Cut and paste worksheets - students cut and paste the character traits for Dorothy, Lion, Scarecrow, Tin Man, Wicked Witch, Glinda and the Wizard. ♥ Bubble map activities - students write their own character traits to describe the qualities of Dorothy, Lion, Scarecrow, Tin Man, Wicked Witch, Glinda and the Wizard. Character Traits Yes/No Game is a perfect resource to use as a book companion after reading the story, 'The Wonderful Wizard of Oz' by L. Frank Baum. By playing this fun and interactive game, it will assist students to make inferences about characters, expand their vocabulary and consolidate their understanding of character traits. Are you looking for a fun and engaging activity for students to review character traits? This book companion consists of differentiated 'Who am I?' worksheets where students write clues to match the characters in the story, 'The Wonderful Wizard of Oz,' by L. Frank Baum. • 2 worksheets - students cut and paste the characters from story to match the character trait clues. • 2 answer sheets for cut and paste activities. • 2 worksheets - students write a character trait to match each character (Dorothy, Toto, Wizard, Wicked Witch, Glinda, Winged Monkey, Scarecrow, Tin Man and the Lion) - suited for students who can construct a simple sentence. 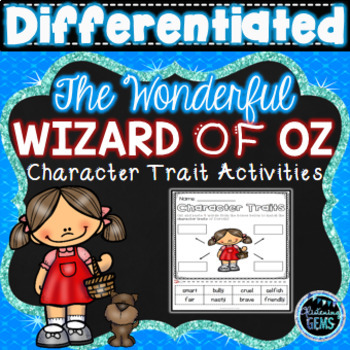 • 1 example sheet - Dorothy - 3 character trait clues - use to model to class. Please see the preview for a snapshot at what the bundle entails. Looking for More Fairy Tales Activities? This bundle includes character traits activities for Little Red Riding Hood, The Three Little Pigs, Snow White, Jack and the Beanstalk and Cinderella.